Almost every woman in this world has dreams of having long hair. Long hair is the ultimate symbol of sexiness and makes most women feel feminine. Sadly, not all of us are blessed with the ability to grow long luscious hair. Some of us are destined for only short to mid length natural hair! Part of the reasons behind this can be genetics, life style, diet or maybe just the wrong choices when looking after your hair. If you are fed up with struggling to grow your hair or want long hair in minutes clip in hair extensions are the best option for you! The great thing about using clip ins is they are minimum commitment. You use them when you want whether it be daily for work or just on a special occasion. 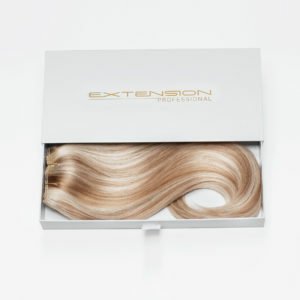 The Extension Professional clip-in hair extensions have just been launched in Harrods, London and are incredible! Take a look at our before and after above. You can have luxurious locks in an instant. They are crafted from superior quality, ethically sourced human hair, they feature a double-bar design with 150g of hair layered over two easy-to-use wefts for a seamless blend. They offer enviable volume, extra thickness and ‘swishable’ length with a natural, undetectable finish. With comfortable clip-in attachments, the Extension Professional range won’t damage the hair and the easy removal mechanism lets you decide whether you wear them every day or just for special occasions. What more could a girl want?! For more information on these beautiful clip ins call 0203 416 4136 or email Claire@extensionprofessional.co.uk. This entry was posted in Blog and tagged beautiful hair, clip in extensions, clip inhair extensions, clip ins, extensions, hair, hair extensions, hairdressers, human hair, human hair extensions, long hair. Bookmark the permalink. ← Why Choose Our Clip-In Extensions?